One of the finest, and most proven intermediate and big game calibers of all time, meets squarely with one of the most proven brand names in the ammunition production history; and one of the lines that has redefined and represented the high-water mark of performance in the hunting cartridge market segment for many years. 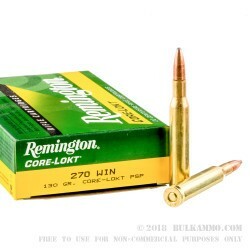 This is the Remington Core-Lokt 130 grain pointed soft point projectile in the .270 Winchester caliber and is a reloadable, brass cased, Boxer primed cartridge. 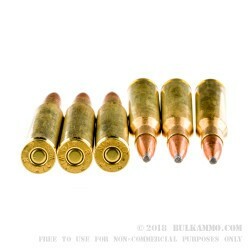 The capacity for easy reloadability in such a great deer cartridge is a premium factor and the price point for the top-quality brass this cartridge gives is an excellent value. If you need a round that can perform in the field, and then be used for custom handloads, this is among the best there is. The .270 is an impressive caliber and can be custom loaded for use in all types of situations. This load is perfect for the smaller game in the category of “large game”, and for truly intermediate sized game. Spectacular static ballistics as listed offer great stopping power over great distances: 3060 feet per second velocity and 2702 ft. lbs. of energy at the muzzle. 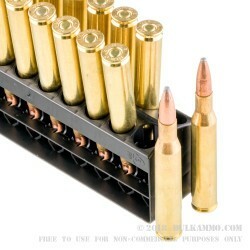 Shoots better than super premium ammo out of my Browning X-Bolt White Gold Medallion!